Scarlet Hopewell keeps having the same dream. She dreams about a magical world, a world where winged creatures sculpt with light, and dogs talk. One day Scarlet’s father brings home an abandoned puppy with strange blue eyes. Dakota is smart—maybe too smart. And he’s getting a lot too big. News shows start to take an interest. As the beginning of the school year approaches, ominous storms have everyone on edge, and Scarlet’s dreams are getting darker and more vivid. When the front door is blown off its hinges one night by three beautiful, silver-voiced men, Dakota leads the Hopewells in their escape into the world of Scarlet’s dreams—a world she alone can save. 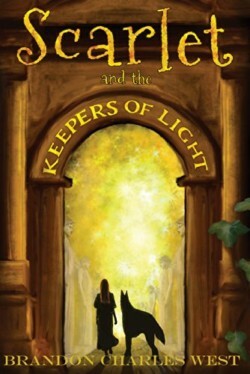 Scarlet and the Keepers of Light, the first in a four-book series, is a fantasy for all ages about the adventure of growing up. Trapped in a ruined world, Scarlet offers hope to others in her sanctuary, but her own faith is fading. Unable to learn the magic she needs to face Prince Thanerbos, she’s afraid she’ll never fulfill her destiny as the legendary For Tol Don. 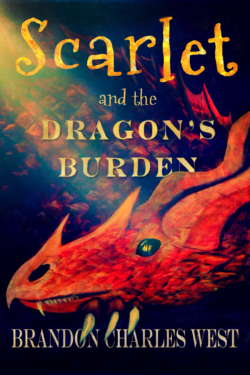 But when word reaches Scarlet and her companions that they might not be the only ones stranded in the nonmagical world, she sets out on a new quest.